The natural stone this small tamarack group was planted on is nice, but far too visually and physically heavy. Today I planted it in a more manageable stoneware crescent by Chuck Iker. See here for an earlier post about this tree. Before. Roughly 40 pounds of Canadian granite. April 7 2013. Still needs some bud and branch thinning, and a bit of wire. The planting angle was adjusted slightly to emphasize the leftward movement of the group as a whole. This entry was posted on April 7, 2013. 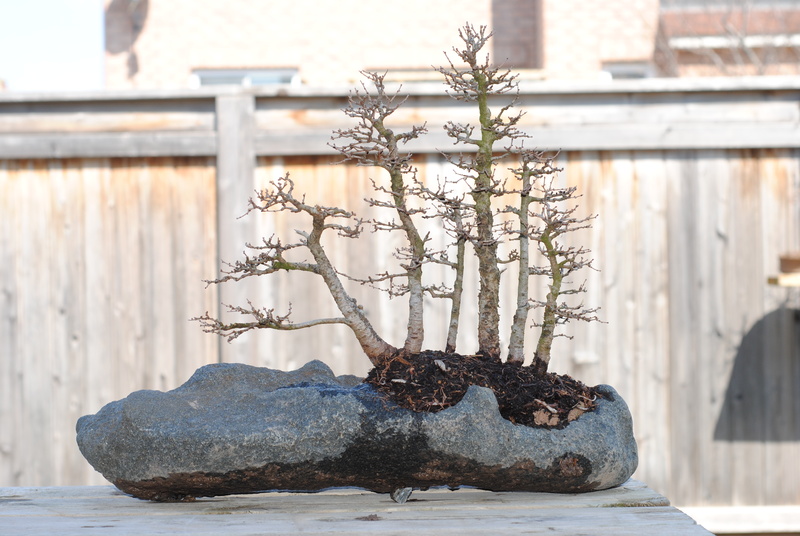 It was filed under Forest planting, Larix laricina, Repotting, Yamadori. I think it would be more esthetically pleasing to use the new container upside down. That is convex up (versus convex down or concave up now) so that the group is arching over a hilltop – the hilltop imaged by the arching containing. Hi Jim, I agree it would give a very interesting image. I even toyed with the idea while repotting it. However, the bottom of the rootball is convex. To make it hug the “hilltop” as it should, I would have to tear apart the composition and ruin the structure of the rootball. Keep in mind this planting has been growing in a rock pocket for 10 years. I like the shell a lot. When you wire the far left trees lower branch would really add if you could add some dynamism to it. Hi Aaron, very nice. Is the largest tree the same tree as in the 2002 pic? If so, impressive thickening of the trunk while growing on the rock! No I am certain the current main tree was added in as an afterthought sometime between 2002 and 2005. It is a collected tree and much older than the rest of the group based on the flakey bark.